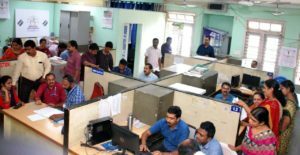 The Election Cell ,functioning at Kozhikode Collectorate is set ready to meet all grievances related to coming general election.The aim of the wing is to make election free and fair.Since the announcement of election, a dedicated team is deployed under Election Deputy Collector,Civil Station. A toll free number is available on 24 hour basis to register public’s doubts and complaints including the violation of model code of conduct. E-posting,information collection, data entry,c vigil monitoring,command and controlling cell,coordination,evaluation of online complaints are the main functions of the cell. This News was posted on Wednesday, March 27th, 2019 at 11:50 am and is filed under City Talk.